July 11, 2007. Our LA investigator Erik Evens found this Dolphin at Marina del Rey in July, 2007. 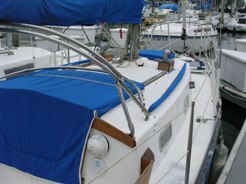 He later reported on Feb 15, 2008 that she had moved to a new location in the harbor and had recently had a major re-do. One day we will make direct contact with the owner. 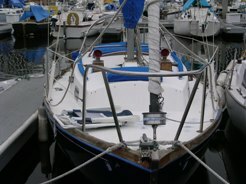 She had no name, number or owner name so we put her up on our Roster as the 'Blue Hull Dolphin' at Marina del Rey, and waited. Ron,I got a call from a colleague about a week ago, saying he was working with a gentleman who had spent a great deal of time leaning over the fence near the Del Rey library, staring at my boat. The guy wanted a boat like that--what were they called again...? Fast forward a week. Dario, the gentleman on the fence, phoned me to say he'd just bought a blue-hulled Yankee Dolphin in Marina Del Rey -- and would I look at it for him, etc. I asked him the hull number: "Ehh," he said--and there was a bit of a pause--"Number Eighty three." I had a cursory look at the boat this afternoon, and took some pictures for your site. I'm sure Dario will tell his own story soon enough - and hopefully someone with knowledge of #83's past. It appears to have been a Bay Area boat at one time, judging from the chart in the table...and the woodstove in the port 'settee'. There were charts of Monterey aboard, as well; it would be interesting to know if this boat ever berthed in Monterey. I had a cursory look at the boat this afternoon, and took some pictures for your site. I'm sure Dario will tell his own story soon enough (and hopefully someone with knowledge of #83's past; it appears to have been a Bay Area boat at one time, judging from the chart in the table...and the woodstove in the port 'settee'). There were charts of Monterey aboard, as well; it would be interesting to know if this boat ever berthed in Monterey. Outside, the coamings are teak and in good condition, with teak Dorade boxes forward. 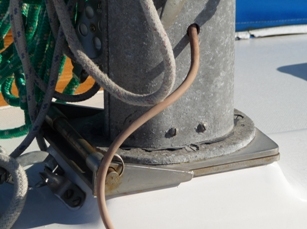 The rigging looks older, with original bronze turnbuckles throughout. A pair of nice self-tailing Lewmars, some well-placed track -- with some serious-looking, large diameter turning-blocks for the jib leads. The dodger is well made, and nicely proportioned, but the canvas is starting to show its age. I'm so glad I didn't see this one before Dario; they say one should never be a two-boat owner: imagine owning two of the same boat! November 13, 2010. Josh Gardener, a Dolphin enthusiast transplanted from CA to Camden, Maine, and looking for a Dolphin of his own, emailed me about a boat he looked at some time ago in Marina del Rey - one he knows he let get away. He recalled that her name was Breeze. A quick check of the name Roster - no Breeze - and the DFI pulse rate increased. On a follow up email Josh sent in some pictures - she was beautiful, and blue! I recalled that in our Roster we had a blue Dolphin at Marina del Rey! And she too had that wood stove! It would surely have been nice in Maine. 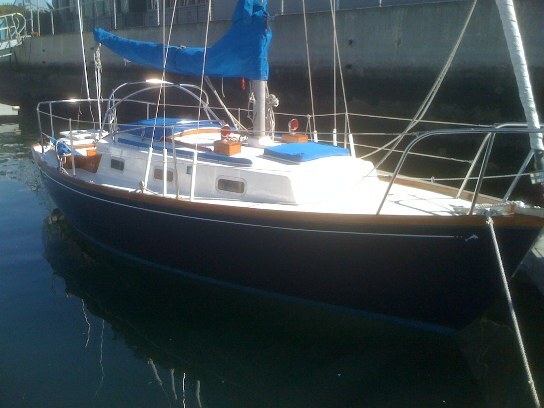 I almost bought a bought named "Breeze" in Marina del Rey. The owner told me she had sailed from San Francisco to Fiji in the mid seventies! However, finances precluded my buying her and I have regretted it ever since. "Breeze", I believe, was the name although I think it may have been casual. A previous owner was Willie Hermes, a great, great guy and brilliant blues guitarist and singer, originally from Texas. He now lives in the Pasadena, CA area. I understand he got the boat from his Dad in San Francisco and brought it down to LA, to Marina del Rey. Willie sold the boat to a young couple and the last I knew she was still berthed there. November 24, 2010. Dario Rubinsky checked in, and has updates coming - stay tuned. I thought this may help others - it helps me a lot. I sail mostly alone, and like to troll a fishing line, so when the bite happens, I heave to ,fix the tiller and I am fishing, stopped, in a matter of seconds. Also it helps when I am alone and need to reef, and when I need to heave to. 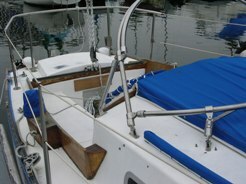 I usually sail with the outboard in the well, and with this system, and using the outboard as a trim tab (when needed) I can let Breeze take care of me, and enjoy. It's a continuous tiller stopper - it allows me to fix the tiller in any position desired (and height too with a single action by pulling the line, at the center), and to undo, by releasing the line at the two cleats. 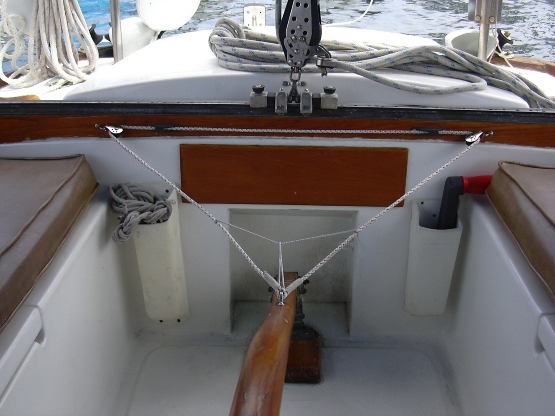 As a result of the triangle that the line makes, it also solved an uncomfortable problem that I usually had, the tangling of the main sheet behind the tiller rudder connection. Because of this set up the main sheet is always in front of it . The two little lines inside the triangle are elastic and serve the purpose of giving some tension to the continuous line so it keeps tight when not using it. I am trying to put this idea in the open because it solved many little problems that were there with the other systems offered., I read an article which suggested that instead of the well known approach to man overboard (the figure 8), doing a "Heave To" will serve the purpose of rescuing with less time and more efficacy. I went out and practiced the maneuver, realizing that to fix the tiller after heaving to, will make me take my eyes of the fallen, and also take some precious time I can use for the rescue. 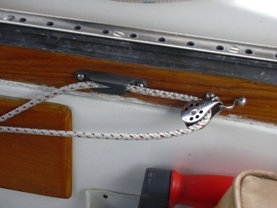 This same problem shows up when reacting to a bite when trolling for a fish and the bite happens - it requires attending to the tying of the tiller system (tiller tamer), and in the meantime, you are dragging the fish. 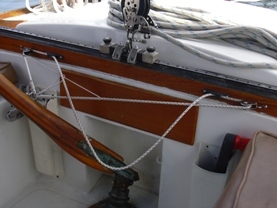 Once the tiller is fixed in any given position, to make a correction, will require untying and retying again with more time and inconvenience. This seal played with the dolphin for half an hour, it was quite a show. Hope you are ok.
December 16, 2011. 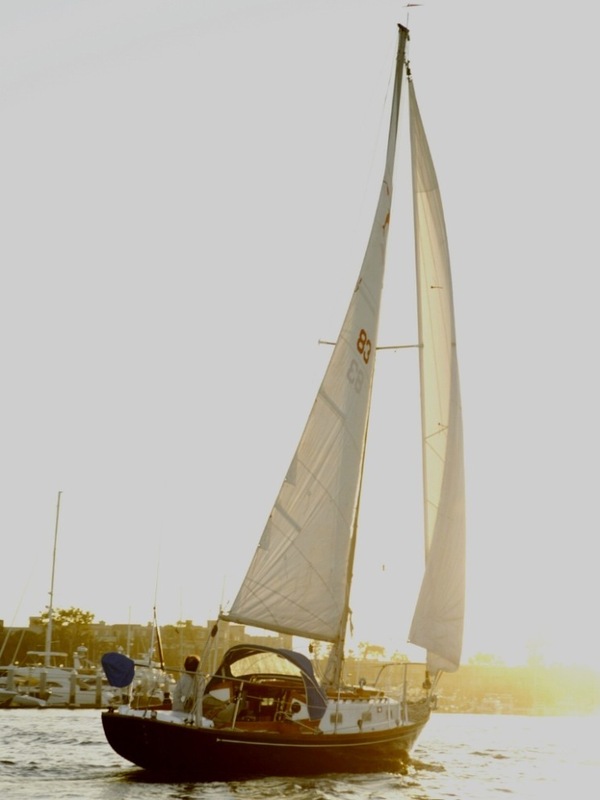 Here is a sailing picture of Breeze - filling a gap in her story. fair winds, and all the best! !